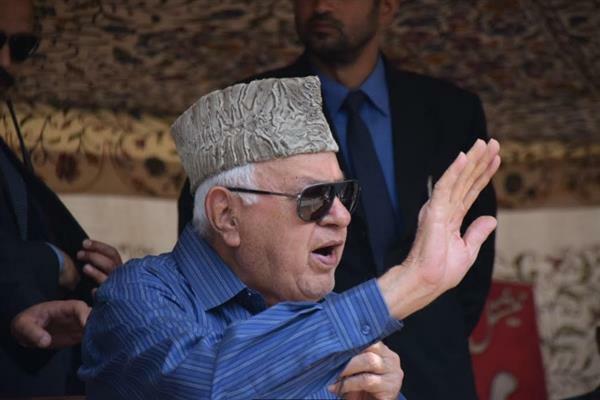 Srinagar: National Conference (NC) President Farooq Abdullah on Sunday said that Prime minsiter Narendra Modi and BJP President Amit Shah are the biggest enemies of people who believe in dividing the nation on basis of caste, creed and religion saying that people have made it a point not to fall prey to the divisive agenda of BJP. Addressing a public meet in Mir Bahri Dal, party president said that BJP is trying to diverge the attention of people by propping up emotive issues. “These people want to change the very framework of the Constitution of India, which grants equal rights and opportunities to everyone. It is the constitution of India which grants rights to profess any faith. It is the same constitution that confers upon our state certain constitutional safe guards. It is the same constitution which grants our state a special status by means of Art 35 A and Art 370. These people have always shown abhorrence for our special status and special constitutional position,” he said adding, “The other day BJP came up with its manifesto which explicitly reflects the hatred BJP boasts for the identity of our state. They have forcefully vowed to do away with the provisions of Art 370, Art 35 A in that manifesto,” he said. He said that National Conference will not allow anybody to fiddle with states special status.